There have been a number of recent reports in scientific journals about variations on the speed of light. These include experimental results allegedly showing information transmitted faster than the speed of light in a vacuum (called c, = 300,000 km/sec ( = 186,000 miles/sec). There have also been reports about the opposite effect—markedly slowing down light itself. And just recently, scientists have even reversed light. How is this possible, and what does it mean for biblical creationists? Einstein’s theory states only that the phase velocity of light in a vacuum is constant. Much of the sensationalism could have been avoided if reporters had understood the difference between group and phase velocity. A number of enquirers asked if this experiment was significant for distant starlight travel time or c-decay theories. Aside from the phase v group velocity distinction, we pointed out that light is always slowed down in matter (referring here to the phase velocity), because it is constantly absorbed and re-emitted—the light is focused on the retina in your eye precisely because the lens and cornea slow down the light by about 30%. Many people need an outside lens which works on the same principle. Now, Dr Hau3,4 and another team led by Dr Ronald Walsworth and Dr Mikhail Lukin of the Harvard-Smithsonian Center for Astrophysics independently announced that they have slowed—and stopped—light.5 This time, Dr Hau’s team turned off the coupling beam before the probe pulse had emerged, so the pulse ground to a halt. When the coupling beam was turned back on, the probe pulse re-emerged. What happened was that the information in the probe pulse was stored in a ‘quantum coherence pattern’ imprinted on the atoms, and when the coupling beam was turned on, this information was ‘read out’ and converted into photons again. They could even chop up the original pulse into three, or ‘read out’ such that the re-emerging pulse was shorter and more intense.4 Dr Hau’s team claim that this system could be used in quantum information processing. 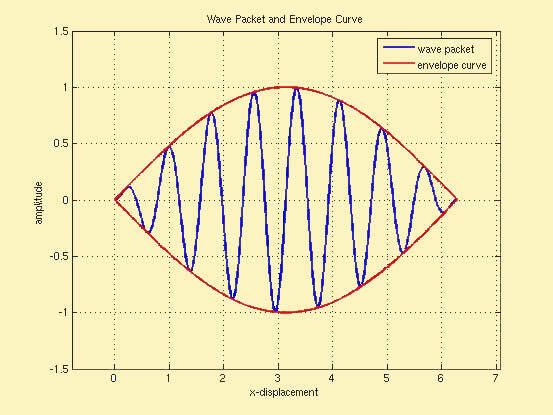 Update 12 May 2006: The same principles apply to reversing light (negative speed), as achieved by the research team of Robert Boyd, M. Parker Givens Professor of Optics of Rochester University, NY. 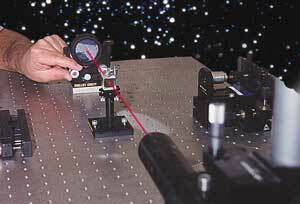 They first split a pulse of laser light into two. One was sent through an optical fibre doped with the rare earth metal erbium, while the other was sent parallel as a reference. The peak of the pulse emerged from the back of the fibre before it entered the front, easily beating the peak of the reference pulse. Then they cut back sections from the front end of the fibre to time the arrival of the peak at the cut end. Working out the time sequence from this data of when the peak arrived at a particular point, they showed that the pulse peak was moving backwards. It is like approaching a store with a closed-circuit security TV camera. As you walk past it, your image first appears on the far side, walks in the opposite direction and passes you then disappears on the other side of the screen. Similarly, when the pulse enters the fibre, a second pulse appears on the back end. This moves in reverse, and also releases a forward pulse from the back end. So there are two unusual features: the reversal as well as the apparent faster-than-light travel where the pulse that enters the front of the fiber appears out the end almost instantly. Rochester university has some animations of ‘fast light’, ‘slow light’ and ‘backward light’, showing how it is the group velocity that has been changed in all cases. Hau, L.V., Harris, S.E, Dutton, Z. and Behroozi, C.H., Light speed reduction to 17 metres per second in an ultracold atomic gas, Nature 397(6720):594–598, 18 February 1999. Return to text. John Marangos, J., Slow light in cool atoms [comment on Ref. 1], Nature 397(6720):559–560, 18 February 1999. Return to text. Chien Liu, Dutton, Z., Behroozi, C. and Hau, L.V., Observation of coherent optical information storage in an atomic medium using halted light pulses, Nature 409(6819):490–493, 25 January 2001. Return to text. Cornell, E.A., Stopping light in its tracks [comment on Ref. 3], Nature 409(6819):461–462, 25 January 2001. Return to text. Scientists Bring Light to Full Stop, Hold It, Then Send It on Its Way, New York Times, 18 January 2001. Return to text. New Scientist 170(2291):25, 19 May 2001. Return to text. [Note added 9 July 2001] See Dr Hau’s popular/semi-technical article, Frozen light, Scientific American 285(1):66–73, July 2001. Return to text. [Note added 12 May 2005] Sherwood, J., Light’s Most Exotic Trick Yet: So Fast it Goes … Backwards?, Physorg.com, 11 May 2006. Return to text.